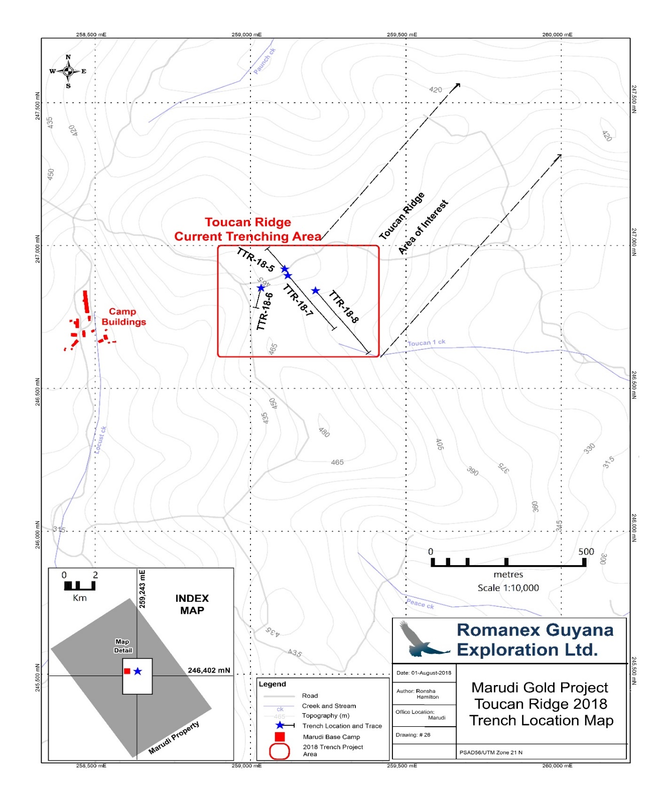 August 14, 2018 / TheNewswire / Vancouver, Canada - Guyana Goldstrike Inc. (the "Company" or "Guyana Goldstrike") (TSXV: GYA, OTC: GYNAF, FSE:1ZT) is pleased to report it has received initial assay results from trench TTR-18-8 completed at the Toucan Ridge area on its Marudi Gold Project ("Marudi" or the "Property") located in the Guiana Gold Belt, Guyana, South America. TTR-18-8 was trenched a total of 280 metres with 104 samples taken for fire assay and selected samples re-assayed for total metallic content. These are initial assay results from trench TTR-18-8. The remaining fire assay and total metallic content results from trench TTR-18-8 are pending and will be reported once received, reviewed and compiled by the Company. Peter Berdusco, President and CEO states "The geological team has successfully confirmed the presence of gold in the quartzite -metachert host rock in trench TTR-18-08 at Toucan Ridge. It is noteworthy that trench TTR 18-08 has returned the longest length of gold mineralization to date from our 2018 trenching program at Marudi. This is also further complimented with the confirmation of high-grade gold in these results. The 1.75-kilometre-long Toucan Ridge area of interest continues to develop as a priority target for our upcoming drill campaign which will test for gold mineralization at depth." To date, the Company has trenched four areas of interest: Paunch, Pancake, Marudi-North West Extension and Toucan Ridge, which is the current area being trenched. In May 2018, trenching samples from the Paunch area returned the trenching program's first significant gold discovery with high-grade assay results of 7.45 g/t gold and 5.98 g/t over 2 metres respectively. In July 2018, trenching samples from TTR-18-06 at Toucan Ridge returned the trenching program's second significant gold discovery with a total metallic weighted average assay of 1.27 g/t over 4.5 metres. 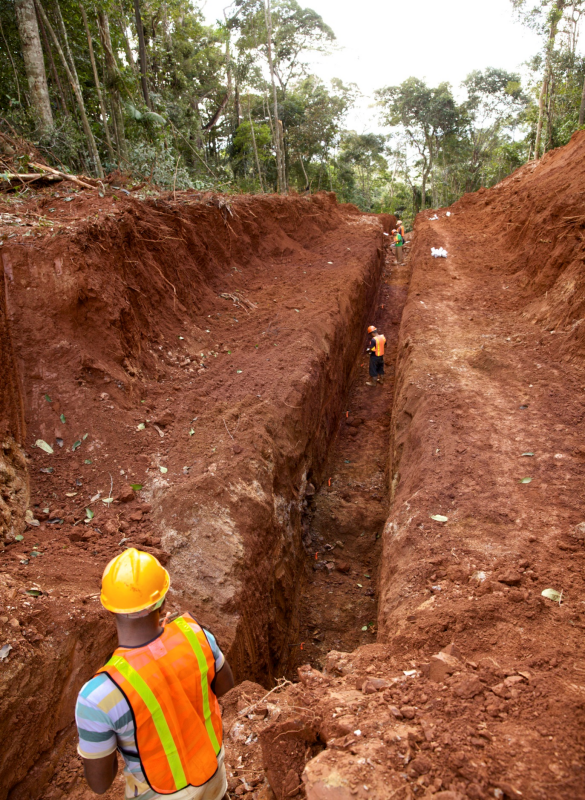 To date, a total of 704 metres of trenching has been completed in the Toucan Ridge area. 254 samples have been taken. The exploration team will continue to explore along the ridge progressing in an eastward direction with each new trench site stepping out roughly in 50-100 metre intervals, mainly perpendicular to the ridge. At Marudi, all important gold mineralization discovered to date is associated with the medial quartzite-metachert (host rock) unit of the Marudi Mountain Formation. Gold occurs within the magnetite-hematite rich quartzite and in the magnetite-silicate iron formation. Mineralization of the host rock may be affected at surface by the erosion at different levels of the strata. Therefore, all discoveries of quartzite-metachert on the Property are considered important for the potential of containing mineralization at surface and/or at depth and should be explored through trenching and drilling. When discovered these areas are assigned high levels of priority for further exploration work, including drilling in the Company's planned upcoming drill program.